EcoStar – the nationwide brand of electronics has announced big discounts on the prices of LED Televisions during the Pakistan Super League (PSL) Cricket Season 2017. The consumers, who want to buy their new LED televisions, can now take a great advantage from this special offer, to buy a wide range of feature-rich EcoStar LED TVs, at unbelievably low prices. This way, they can enjoy the memorable moments and fabulous experiences, at home, with their beloved families and friends. During this ‘PSL’ Cricket Discounts Offer’, EcoStar’s 32 inch LED TV is available at an amazing discounted price of Rs. 19,900 only, whereas the regular price of this popular TV model was 20,900 Rupees. Similarly, Price of the 43 inch LED TV has been sharply reduced to Rs. 34,500 only, brought down from its regular price of Rs. 36,900. 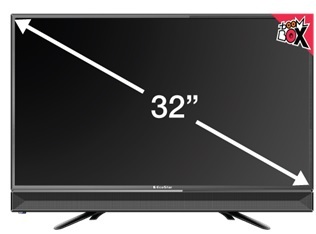 The 50 inch LED TV is now available at a discounted price of Rs. 49,900, although the regular price of this large TV was Rs. 52,700. EcoStar reflects technological excellence, as the leading producer of LED Televisions, with world-class quality and cutting-edge features. In Pakistan, DWP Group is the official distributor of EcoStar that ensures nationwide availability of its products, along with prompt after-sales support, through an extensive network of outlets.